Byte Rot: What does REST's Client-Server mean now? [Level C4] In "What does coupling mean ...", we reviewed three client-server patterns (with their anti-patterns) based on the concern. In this post, we will carefully examine the new meaning of client-server web applications. This will serve as a primer on my new work to define Client Server Domain Separation (CSDS). As I explained in the coupling post, I was challenged by recent emergence of attempts to define client-server relationship, one of which being ROCA. There seems to be a recent trend in the REST-aware community by disgruntled developers who believe too much control has been shifted to the client-side. As such they are trying to come up with practices/styles to move some of the control back to the server. As we saw in the coupling post, we need to understand if a functionality is client-concern, server-concern or mixed concern. Implementing the functionality in the wrong side of wire can be initially tolerated but finally takes its toll. Below we will try defining building blocks of our discussion. When we talk about the domain below, we refer to the concerns implemented/expose in the client or server. Server is responsible for defining a domain (server domain) and maintaining its state and consistency/integrity. Server usually has very complex components yet it hides its complexity behind its services. Service is composed of API and domain objects. In a RESTful world, API is HTTP REST. 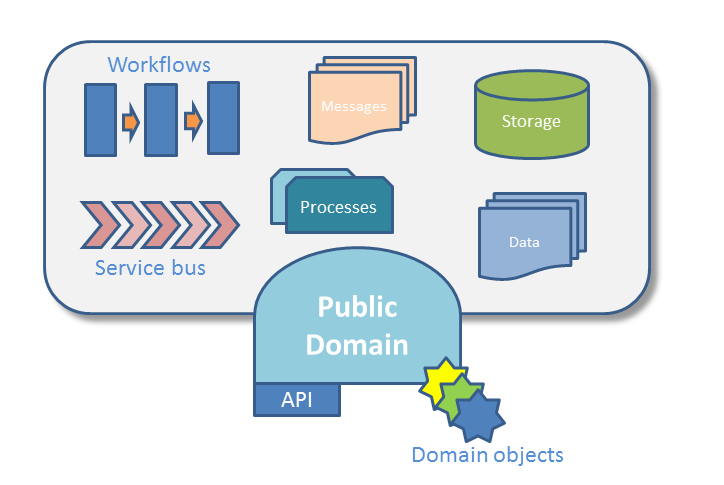 Domain objects are representative of the server's domain model. While Server can have a complex domain, we refer to server domain as only the publicly available domain. Server should not have a knowledge of the client type. Although such information can be shared with the server (for example through User-Agent header), it should not be used other than for auditing or statistics. Domain objects sent to the client are usually looked down upon and treated as second class citizen. They are sometimes called DTO (Data Transfer Object) or ViewModel. While this is OK in a server development scenario when the focus is to decide how much of the server's whole domain to be exposed, these models are not to be mistaken with Value Objects since they are entities (they have identity according to DDD). Domain object can be a fully rendered HTML (markup) in its semantic form (i.e. no display semantics such as <b> or <i>). Documents are domain objects for example a blog domain has a post domain object. Server itself can be a client of one or several servers. ifttt is a beautiful example of it. Client is responsible for using server(s) services to provide value to the user. In the process, it defines a domain which is usually different from server domain, although there is always an overlap. Client has a life of its own, able to maintain some level of functionality with no server access. Please note that we did not mention user on the definition of server. Server is being abstracted away from the user by the client. Client can still provide some of its values to the user even when server down. Funny enough, I lost connectivity for half an hour while I was typing this blog and I carried on typing. When re-connected, Blogger saved my worked. I love listening to online radio while working. I use TuneIn on my android to listen to music based on my mood. TuneIn is a great app that allows you to search online radios and podcasts. So one of the functionalities is the directory service of radio stations. This functionality is provided by TuneIn servers (that maintain the state and its consistency/integrity). It defines a server model that consists of name, URL, style, icon, etc. Client does not know how the directory is created or how often the information gets updated. On the other hand, when I click on a station to listen, I connect to the radio server. Domain of the server has music streaming, current artist, etc. For the radio server, it is all the same if you listen to music in your browser or in the native client on your phone. Client does not know how music is stored, chosen, etc. Now if I really like a song, I can share it in twitter. Twitter server, while for security reasons (OAuth) knows the application I am using, it does not really care. Publishing my tweet is all the same for it. So as you can see, Twitter's server domain is fully concerned with users, their tweets, re-tweeting, etc while TuneIn client only cares about publishing a tweet, so their domains have a tiny (yet important) overlap. Some the client functionality has nothing to do with server. Playing music on the device is fully a client concern so does not exist on the server domain. For example, online radio's streaming servers would not know if the data they are sending will be even heard by the user (e.g. speaker could be on mute or worse, the client uses the data for illegal dumping of the songs). Does the classic client look to you as the REST Eutopia? Having read Fielding's dissertation snippet above, which one do you think represent REST better? Web application is the usage abstraction of the client. While the server domain used to pretty much define the web application, client is becoming more and more important in defining it. Now what does web do in the "web application"? Nowadays, almost every application is a web application: the client uses one or more cloud services to enrich the experience. Unless it is a simple drawing or editing tool, most applications are web applications. Basing your web application on REST will help achieving better separation as well as making an efficient use of the web. Having said that, today's world demands more and more from the computing industry. Server Push model (gaining popularity in node.js/websocket world) requires a stateful server which is a REST no-no but today's virtualisation and cloud elasticity has made scalability a much smaller problem. For most web applications, however, following all REST constraints is the best practice as very few applications require Server Push model. So what do I think of the new trend? must-server advocates "classic" model (engulfed client) and ignores the client server separation prescribed by REST. It does not respect client domain (must-no-duplication) and it rules and logic. Single-Page-Application is not ROCA-compliant (see discussions). Client and server have their own domain - as REST prescribes. Server defines a domain and maintains its state and integrity. It hides its complexity behind its services while other than authentication and authorization does not need to know anything about the client. Client through the usage of server(s) services provides value to the user. It defines its own domain that has overlap with server(s) domain. Web application is a plethora of different devices and technologies. As such, defining a style requires considering all such scenarios. 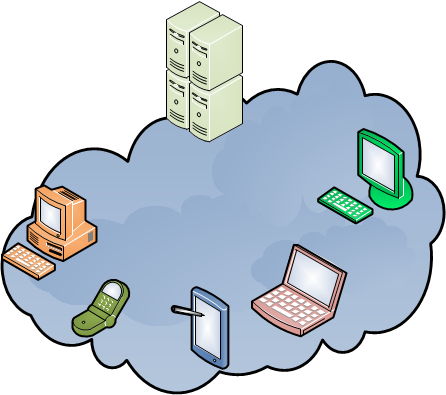 We will talk more about Client-Server Domain Separation (CSDS) in the upcoming posts.